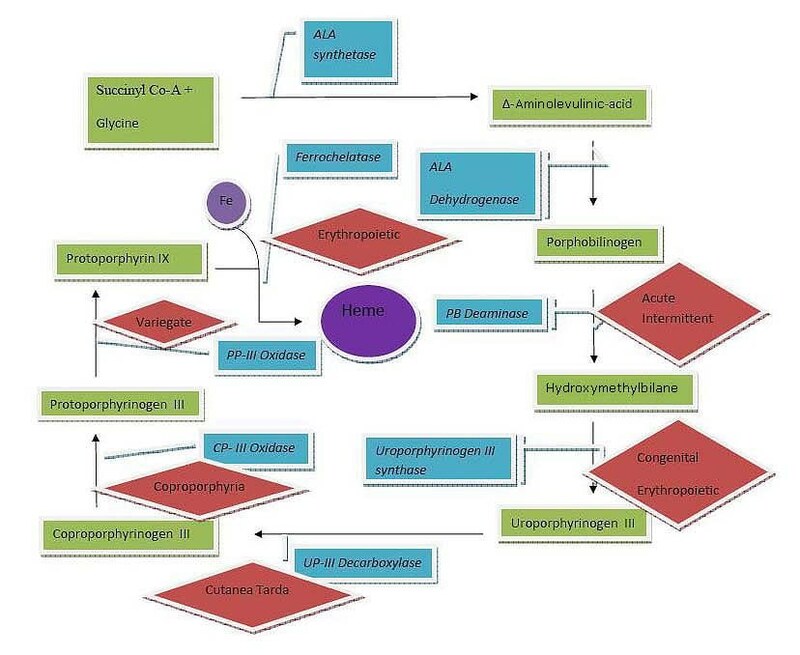 Despite most non-medical people thinking porphyria is one disease, there are actually SEVERAL variants - some more rare than others - and typically classified by whether they predominantly affect the skin, the liver/nervous system, or a combination of the two. Porphyrias are characterized by the buildup of "porphyrins", a component of Heme, which is itself a component of red blood cells. What are the symptoms of the porphyrias? If it's early in the process the accumulation of excess components ("metabolite intermediates" such as aminolevulinic acid and porphobilinogen) will generate acute nerve and abdominal pain, vomiting, muscle weakness, respiratory failure, high blood pressure, seizures and mental symptoms such as hallucinations, depression, anxiety, and paranoia. Rapid heart rate and other cardiac issues may develop as the autonomic nervous system gets involved. Pain can be VERY severe, and sometimes chronic if it's undiagnosed for a long period of time. Constipation or diarrhea may be present. Irritability and insomnia may also be present. Acute porphyria comes with an increased risk of primary liver cancer and the patient MUST be monitored for this risk their whole life. If the defect is later in the heme production process, the porphyrins will accumulate in the skin and cause photosensitivity (photodermatitis), blisters, damage to (and possible tissue death of) the skin and gums, itching, and swelling. Sometimes there is increased hair growth on areas such as the forehead. Abdominal pain is rarely present, which which will distinguish the skin-only forms from the others. Urine color - especially during an attack - may be pink, reddish or brown color on exposure to sunlight or fluorescent lights (since fluorescent lights give off UV, it is possible that this is is a photoreaction reaction to the UV.) Sometimes the urine may even have a purple tint. Patients may have seizures due to the nerve involvement of some forms - however many seizure medications will make the problem WORSE, not better. Pain is often "out of proportion" to the symptoms, and because of this - especially for women - will run the risk of doctors thinking the patient is just "looking for drugs." Very severe ("intractable") pain is TYPICAL for acute porphyria attacks, and doctors need to be told that porphyria is either a suspected or known diagnosis. Porphyrias are a set of syndromes characterized by a defect in the body's process of manufacturing "Heme", part of the hemoglobin molecule in red blood cells. The principle issue in the porphyrias isn't the defect itself (people without porphyria can still have heme production defects here and there without developing porphyria symptoms) - the problem comes in the accumulation of porphyrins, which are toxic to tissues in high concentrations (and are what lead to many of the symptoms.) Four of the eight enzymes in the heme production chain are in the mitochondria, and the other four are in the intracellular fluid. Defects with any of these can lead to porphyrin buildup, and thus one of the forms of porphyria. Where in the chain the defects occur will determine what symptoms the patient has. How are the porphyrias diagnosed? Porphyrias in general are RARE conditions - as a result, many hospitals and doctors will not have the immediate knowledge to recognize it on the spot, and thus diagnosis and treatment may be delayed if they spend time chasing an unrelated diagnosis. Sampling for diagnostics (blood, urine AND stool) MUST MUST MUST be done DURING an acute porphyria attack, not after, and samples must be both kept out of light and properly preserved or refrigerated otherwise a false negative may result. The first things the medical professionals should be looking for is the presence - and amount - of "PBG" (porphobilinogen) and ALA (aminolevulinic acid). Diagnostic bloodwork will indicate whether there are any particular organ issues going on (such as liver damage, jaundice, hemochromatosis, hepatitis-C, etc. ), and CT scanning or MRI rules out other causes of excruciating abdominal pain, such as ruptured blood vessels, punctured organs, colon issues, tumors, and so on. Further diagnostic tests of affected organs may be needed, as well as nerve conduction studies (to see how well the nerves are working) or a liver ultrasound to see how much other damage is going on. There are two basic types of urine tests - one is where they add a few drops of urine to a reacting chemical, and it turns red. There's the "Hoesch Test" and the "Watson-Schwartz test"; the Watson-Schwartz test is an older method. The other basic test is to expose the urine to bright sunlight for several hours (I've seen up to 24 hours mentioned) - and it will darken to a dark red or mahogany color, sometimes with sediment. What will aggravate porphyria symptoms? Periods of hormonal changes will commonly set off an attack: Puberty, menstruation, birth control pills (starting OR stopping), pregnancy, etc. Low-calorie, low-carb diets, "crash diets", alcohol, periods of starvation. Low fiber diets are implicated in constipation problems. Infections (because of the stress it puts on the body's immune system) and sunlight can set off an attack for any of the porphyrias affecting the skin, and sunscreens MUST be titanium dioxide and/or zinc oxide only - the oxybenzone chemical family will NOT work. What is the prognosis of the porphyrias? Once properly diagnosed and treated, prognosis is excellent and the patient can expect to live relatively normally. If untreated and undiagnosed, however, the lifespan is typically greatly shortened due to the long term toxic effects of excess porphyrins on the body's organs (including the heart!) and tissues. Nothing, actually. Many real vampires have photosensitivity, the same as the cutaneous forms of porphyria. However, that's where the similarity ends - porphyria is caused by the buildup of porphyrins in the liver and/or the skin. Real vampirism by itself does not have a porphyrin problem.